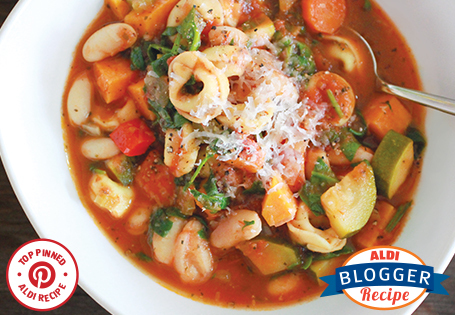 This hearty Italian soup is teeming with vitamins and fiber, thanks to the rainbow of vegetables and lean plant-based protein. In a large pot, heat olive oil over medium heat. Add garlic, onion and salt. Cook until fragrant and translucent, about 5 minutes. Add celery, carrots, bell pepper, zucchini, sweet potato, basil and oregano. Continue to cook for another 5 minutes, stirring occasionally. Add the crushed tomatoes and chicken broth, bring mixture to a boil. Reduce heat to low and simmer, uncovered, for another 20 minutes or until sweet potatoes can be easily pierced with the tip of a knife. Stir in the tortellini and beans, simmer for 15 minutes or until pasta is al dente. Vegetables should be tender, not mushy. Remove from heat and stir in spinach to wilt. Season to taste with salt and pepper. Serve soup topped with freshly grated Parmesan and black pepper. TIP: Though the recipe calls for chicken broth, it can easily be made vegetarian by using water or vegetable broth instead.